Heavenly Mini Blueberry Splenda Pies ~ in Muffin Tins! When summertime rolls around, I’m thrilled ~ warm weather, sunshine and Blueberries! The aroma of these little pies baking was mouthwatering! I’m always on the lookout for blueberry recipes, and now can't remember where this one came from. I mixed Splenda with the fruit instead of sugar, it measures the same as sugar. I didn’t tell Bill it was made with Splenda until later; he didn’t notice a difference with Splenda, and neither did I. For the filling, I added a splash of lemon juice, and a couple of pinches of cinnamon. The pies are easy peasy to pull together, but to make them even easier, use Pillsbury Refrigerated Pie Crust. You’ll be eating dessert in a flash! Baked in a muffin tin, the pies are a perfect-size yummy dessert or snack! These blueberry pies a great dessert for anyone who needs/likes a dessert with low sugar. It’s hard to eat just one! These blueberry pies are a great dessert with less sugar! Grease 6 cups of muffin tin. Dust counter top with flour, roll pie crust out. Cut six 3” circles of crust, press into the bottom and sides of muffin tin. 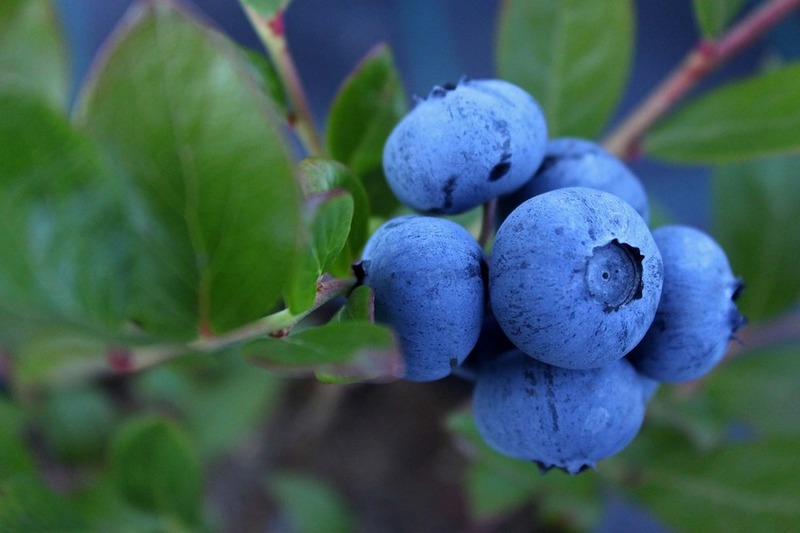 Combine blueberries with Splenda, cinnamon and juice. Fill the cups with the pie filling. Cut another 6 circles of dough and press them on top of each pie, sealing the bottom and top layers of dough tightly with your fingers. In a small bowl, whisk egg and water to make an egg wash; brush over the top of each pie. Bake for about 25 minutes until crust is golden brown. Allow to cool for 10 minutes before carefully removing each pie from tin and onto a cooling rack to cool. You’re most likely familiar with Hasselback potatoes ~ what about Hasselback tomatoes? This trendy little side dish might make you hesitate, but once you try it, you may be sold on it! “Hasselbacking” has been around since the 1950’s, when cooks at the Hasselbacken Hotel in Stockholm, Sweden, were peeling and partially slicing large potatoes, brushing them with butter, sprinkling them with bread crumbs, and baking them. Not only did patrons like the looks of the vegetable, they enjoyed the savory taste and variety of textures it offered. To this day, it’s still on the hotel’s menu. Instead of potatoes, this Cook’s Country recipe focused on tomatoes. They doubled-down on, flavors, and stuffed the tomatoes with savory pesto and tangy pungent Gruyère cheese. Instead of baking the concoction, the tomatoes were given a short blast under the broiler to lessen oven time, allowing the tomatoes to retain some summery freshness. Unfortunately, my camera battery was dead when I wanted to take photos of cutting the slices in the tomatoes. See the same method here with potatoes, showing the wooden spoon handles used to guide the knife when slicing the tomatoes. The end result was fresh-tasting tomatoes, melty cheese, and crunchy crumbs. A great side dish for you tomato, pesto and Gruyère lovers out there! Accordian-like tomatoes, filled with pesto and Gruyère cheese, a great side dish for your dinner table! Line a baking sheet with aluminum foil and set wire rack in sheet, set aside. On a cutting board or plate, using serrated knife, cut 1/4-inch-thick slice from 1 long side of each tomato. Turn tomatoes onto cut sides so the sit flat, then slice crosswise at 1/4" intervals, leaving bottom 1/4" of each tomato intact. Process 1/4 cup Gruyère, basil, oil, panko, garlic, 1/2 teaspoon salt and 1/4 teaspoon pepper in food processor until smooth, scrapping down sides of bowl as needed, about 10 seconds. Arrange tomatoes on prepared wire rack. Sprinkle remaining 1 cup cheese over tomatoes. Broil until cheese is golden brown, about 5 minutes. We all really like peaches here, some more than others, but we all are hooked on this cake! This is a scrumptious summer dessert starring fresh peaches! Peaches have been “iffy” here this summer. Most of them not ripe, and when they do ripen up, they’re rotten. Thankfully, our favorite farmers’ market had a huge supply of Michigan peaches. They looked near perfect ~ I couldn’t resist them ~ fragrant, ripe and drip-down-your-chin juicy. Just what this cake called for! The simple streusel topping is spiced with fragrant cinnamon and cardamom. It’s equally good for breakfast, brunch, a snack or dessert. Finish it off with a scoop of ice cream or a swirl of whipped cream, or just eat it plain, like we do. It’s a moist cake filled with little chunks of sweet peaches! This is a delicious, moist and sweet cake! Grease and flour three - 3x5x2-inch or one - 9x5-inc loaf pan(s). 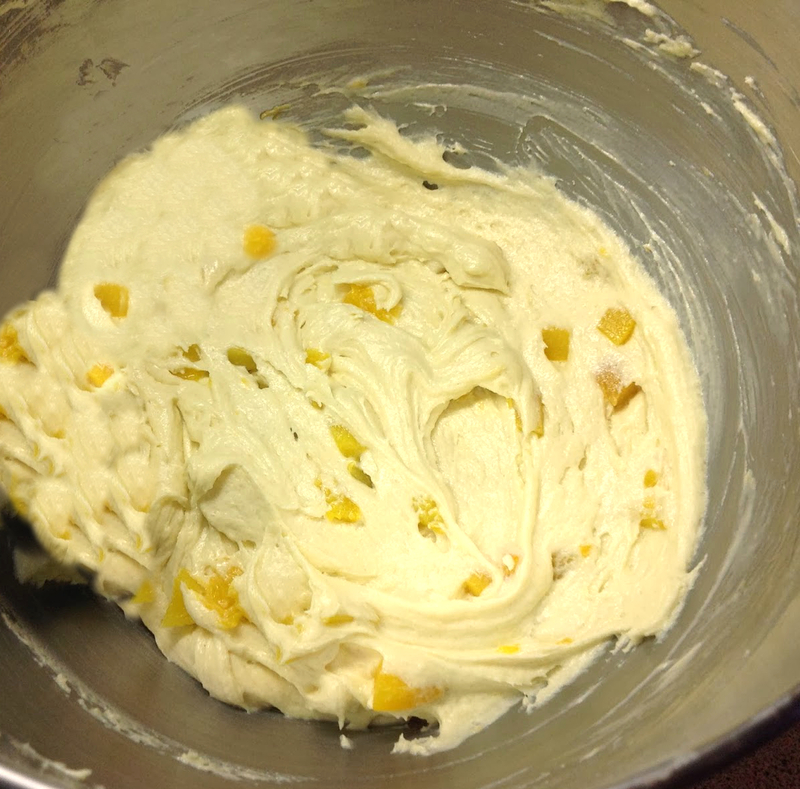 In a large mixing bowl, using an electric hand mixer, beat together the sugar and oil. Add vanilla. Add eggs, one at a time, blending well after each addition. In another bowl, whisk together flour, baking powder, baking soda, salt and cinnamon. Slowly add the dry ingredients to the wet ingredients. Beat until well combined. Stir in diced peaches. Spread the batter into prepared loaf pans. Bake until toothpick inserted into center comes out clean; about 25-30 minutes for small loaves and about 55-60 minutes for large pan. Allow to set for 10 minutes before removing from pan. Let cool completely before slicing. Cream softened butter well, add remaining ingredients. With a fork or pastry blender, combine until crumbly. Scatter over cake before baking. I might live in the Midwest now, but I’m a Southerner at heart! One of the reasons; besides, delicious cornbread, a warmer climate, friendly people and good food, and did I mention cornbread (? ), is that Southern Living has been delivered in our mailbox ever since I was married ~ way back when Mom gave a subscription of it to me. Which leads me to zucchini and this recipe! The gardens are starting to fill up with the vegetable; consequently, this slightly adapted recipe from SL is perfect for the season! 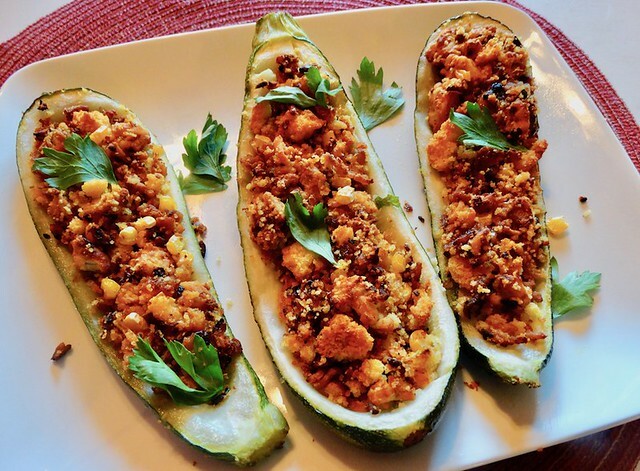 They are tasty zucchinis stuffed with a delicious blend of corn, onions, garlic, cheddar cheese, chicken and spices. Choose squash that are uniform in shape so they will cook evenly. The best kind are long, straight and not too skinny. I will admit there was one problem with my finished dish: I bought ready-made cornbread from the grocery store to speed up the process, unfortunately, I did not sample it first. Too late, I realized the cornbread was very sweet, sort of like Jiffy mix, cake-like. I’m not a fan of sweet cornbread, and seldom add sugar to the batter when I make it. Southern cornbread is traditionally made with little or no sugar (I do claim to top it with butter and a swirl of honey at times) while northern cornbread is sweet and more cake-like. In Bill’s opinion and mine also, this zucchini mixture would have been much better with savory cornbread, the finished dish was too sweet for us. And it was a touch on the dry side; the next time, I would add ½ cup chicken broth to the mixture, somewhere along the line. It's definitely worth another try! Whether you get your zucchini straight from the garden, or the farmers’ market, stock up on it and enjoy this cornbread-stuffed zucchini. Just pay more attention than I did as to what type of cornbread you make it with! Spread cornbread in a even layer on one end of a baking sheet. Cut zucchini in half lengthwise. Using a melon baller or spoon, scoop out zucchini pulp to equal 3 cups pulp, leaving a ½-inch shell intact. Coarsely chop 1½ cups of pulp, reserve remaining pulp for another use. Brush zucchini shells with 2 tablespoons of oil. Place shells on baking sheet with cornbread, and sprinkle with ¼ teaspoon of the salt. Place in 375° oven and bake until cornbread is lightly browned, about 10-11 minutes. Reduce oven temperature to 350°. Heat remaining oil in a large skillet over medium-high. Add ground chicken to skillet, cook, stirring to crumble, until browned, about 6 minutes. Add onion, garlic, paprika, pepper, reserved 1½ cups zucchini pulp and remaining ¾ teaspoon salt to skillet, cook, stirring occasionally, until onion is tender, about 3 minutes. Transfer mixture to a large bowl, and stir in cornbread, cheese, corn and parsley. Divide chicken mixture evenly among zucchini shells. Place shells on a baking sheet. Bake stuffed zucchini at 350° until filling is lightly browned and zucchini is tender, 25 minutes.